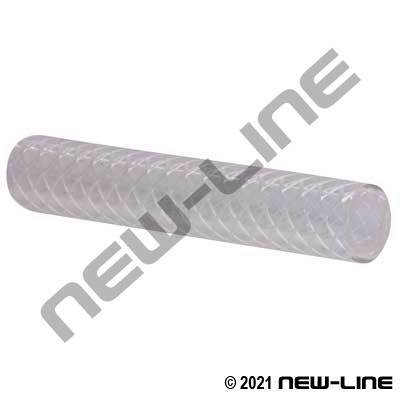 This is a clear, reinforced, polyurethane hose designed for certain applications where standard PVC/Vinyl will not stand up - such as in portable tool fuel lines. The ether based compound is also ideal for transferring granular or abrasive materials that would be damaging to PVC. It provides more kink resistance, larger ID's, and higher pressures as opposed to "unreinforced" polyurethane tubing. Vacuum Rating to 28" Hg. Typical Fittings: N400-BR brass, N400-SS stainless, or N400-NY nylon barbs, N505-BR garden hose fittings, camlocks (larger sizes), brass FBL ferrules, N66 pinch clamps. Construction: Tube: Smooth, clear Polyurethane (85A Duro.). Cover: Smooth, clear Polyurethane. Reinforcement: Polyester yarn.